Next to Benedict Arnold, no other Continental Army general has attracted greater censure than Charles Lee. Not only did he criticize George Washington and connive to supplant him, but some historians argue that he attempted to betray the infant United States. In this brilliant new biography, Philip Papas presents Lee as a complex combination of brilliance, high ideals, and self destructive tendencies. The last child of a colonel in the British Army, Lee followed in his father’s footsteps by securing an ensign’s commission in a British infantry regiment in 1746. He first saw action in the Seven Years’ War, participating in the British Army’s two most notorious American disasters—Braddock’s Defeat in 1755 and the foolhardy assault on Fort Carillon (Ticonderoga) three years later. Lee realized that he and his fellow Redcoats had to adapt their tactics to American conditions and he also became a student of Native American culture. Later in the war, he returned to Europe and distinguished himself in Portugal. Despite Lee’s success, the British Army retired him as a half-pay major in November 1763. Seeking full-time employment, Lee offered his services to the king of Poland. His experiences in Eastern Europe and the Balkans left him with a deepened appreciation for the power of guerrilla warfare. At the same time, he became a supporter of American efforts to resist British tax policies. Lee’s abrasive manner, his profligate lifestyle, and his radicalism quashed any hope of his resuming his career in the British Army. That embittered him, and he decided to seek a new life in British North America. In the spring of 1775, the Second Continental Congress reacted to the outbreak of war by creating the Continental Army. It placed Lee under Washington as that army’s third ranking general on 17 June. Within ten months, Lee became Washington’s second-in-command. Washington and Lee differed both temperamentally and in terms of military doctrine. Washington wanted to mold his Continental Army into an American version of Britain’s land force, whereas Lee viewed a regular army as a threat to American freedoms. He wanted to rely on small detachments of trained soldiers drafted from the militia who would cooperate with roving bands of guerrillas and wear down the British with hit-and-run raids. Such a strategy could have turned the War of Independence into a much more ferocious conflict and stymied the emergence of anything resembling national unity. Papas asserts, however, that the Continental Army ended up working with partisan bands, much as Lee envisioned, before the war closed. Lee proved his worth to his adopted cause by preparing the defenses of New York City and then overseeing the mobilization of the Southern colonies. The British capture of New York in the fall of 1776 shook confidence in Washington’s generalship, and Lee aligned himself with his commander’s critics. Lack of prudence led to Lee’s capture by British cavalry at Basking Ridge, New Jersey, on 13 December. During Lee’s sixteen months in enemy custody, he said and wrote things to his captors that flirted with treason. The Continental Army to which Lee returned no longer held him in awe as America’s ablest and most urbane soldier. At the Battle of Monmouth, 28 June 1778, Washington entrusted Lee with a division composed of troops he had never previously commanded and ordered him to attack the main British army. Lee’s subordinates executed unauthorized withdrawals in the face of enemy counterattacks, permitting Washington to charge Lee with “breach of orders” and “misbehaviour before the enemy” (p. 259). A rigged court-martial found Lee guilty on all charges, and he watched the war play out from the sidelines, finally dying in Philadelphia on 3 October 1782. 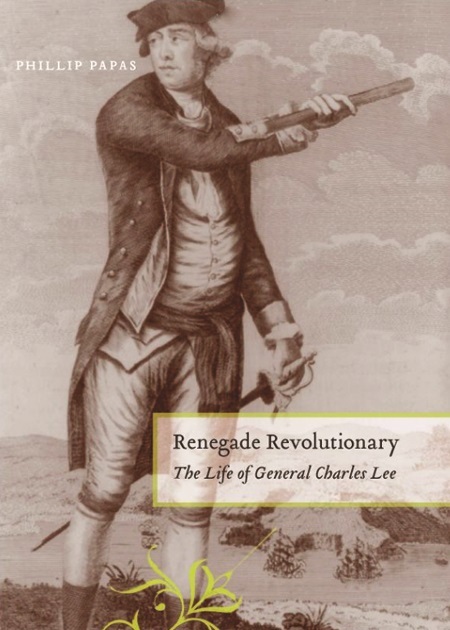 In Renegade Revolutionary, Papas succeeds in deciphering the enigma that was Charles Lee. He also recreates the different worlds in Europe and America that shaped this inspiring and infuriating soldier. This well researched and thoughtful volume represents a major contribution to Revolutionary War history.